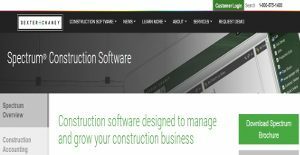 What is Spectrum Construction Software? Spectrum Construction Software is a very rich and reliable cloud-based application for construction and engineering firms that effectively fuses accounting, job costs, and project management. Developed by Dexter + Chaney, Spectrum is a product that represents over 30 years of professional experience in the construction industry. What Spectrum provides comprehensive business management software designed to help small & large construction companies grow and grow fast. Spectrum is created to be with you in every step and every phase, and you should consider it if you are looking for a powerful tool for construction accounting and project management purposes. Expect Spectrum to deliver for you, whether you are working from the office or at the job site, and across the entire life cycle of construction work. Spectrum Construction Software is a product that is built on more than 30 users of experience and expertise in the construction industry. This cloud-based construction software is fused with innovation and investment in the latest technologies, and allows teams to stay focused on their most important projects regardless of where the employees are located. The system comes with a very user-friendly interface that lets you perform all the tasks you need to, whether you’re at the job site or at the office. Optimized for mobility, you can access the system anytime, anywhere, just by opening a web browser. Spectrum does not confuse you with complicated menus. You can tailor the whole platform right out of the box, enabling you to customize the product to suit your needs and make it work for you. Starting and navigating its interactive dashboard is a breeze, as you can set it to display the information you want and know what you don’t need. Accessing tasks and other data related to your work comes easy with its one-click, very responsive InfoBar. The Spectrum feature also offers fully-integrated web-based document management. Wherever you need to be, you can be sure that the documents or images you need for your tasks are immediately within reach. If you are considering Spectrum Construction Software it might also be beneficial to investigate other subcategories of Best Construction Management Software listed in our base of B2B software reviews. Since each organization has unique business requirements, it is prudent for them to desist from looking for a one-size-fits-all ideal software system. Needless to say, it would be pointless to try to find such a platform even among popular software applications. The intelligent thing to do would be to catalog the various essential factors that require consideration such as key features, budget, skill levels of staff members, company size etc. Then, you should do your research thoroughly. Read some Spectrum Construction Software reviews and check out each of the other apps in your shortlist in detail. Such in-depth groundwork can make certain you discard ill-fitting applications and choose the system that provides all the features you require for business success. How Much Does Spectrum Construction Software Cost? We realize that when you make a decision to buy Construction Management Software it’s important not only to see how experts evaluate it in their reviews, but also to find out if the real people and companies that buy it are actually satisfied with the product. That’s why we’ve created our behavior-based Customer Satisfaction Algorithm™ that gathers customer reviews, comments and Spectrum Construction Software reviews across a wide range of social media sites. The data is then presented in an easy to digest form showing how many people had positive and negative experience with Spectrum Construction Software. With that information at hand you should be equipped to make an informed buying decision that you won’t regret. What are Spectrum Construction Software pricing details? What integrations are available for Spectrum Construction Software?